With more literate members of society than ever before, and more members of the professional classes than at any time in the country's history, Victorian Britain was obsessed with self-improvement. 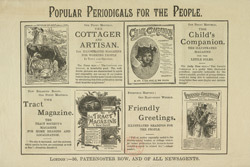 Periodicals and magazines played on this trend, combining self-consciously "improving" or educational subject matter with often sensational entertainment. Nearly 200,000 periodicals were in print at the end of the 19th century, covering a huge range of subjects: animals and nature, children's games and stories, fashion, politics, religion and industry.